But nothing could have prepared Ellie for what awaits at the Glenbroch estate, where she soon discovers very little is as it seems. The rugged, romantic Highlands harbor old secrets and vengeful enemies, entangling her in a web of lies and betrayal. As the line between ally and enemy blurs, Ellie is in danger of forfeiting her inheritance—as well as her heart. I received this ARC in exchange for an honest review. This is my own opinion and will not be affected by this. When I began reading this I wasn't too impressed. There was a lot of description and I felt that caused the story line to drag on a lot, plus it was quite slow in general. However the pace did pick up and I began to feel more intrigued about the mystery and I really enjoyed the romance between Ben and Ellie. I was quite impressed to be honest. Diving into the book, I didn't really know exactly what to expect, mainly because the novel itself wasn't a popular title, & I hadn't heard any opinions of it prior to receiving my copy for review. 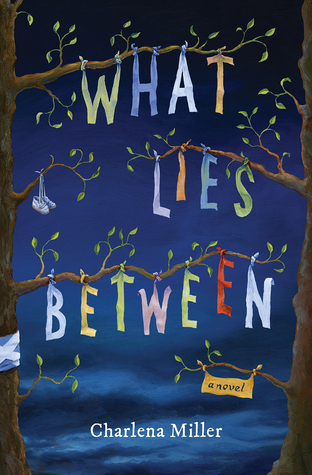 After a few chapters, I was so surprised to discover that What Lies Between wasn't the coming-of-age, self-discovery adult novel I assumed it would be. (In some ways it was) Instead it was a wonderful contemporary, with a ton of mystery/suspense elements blended in. I was definitely not expecting that. Besides the large amounts of description, I really liked Charlena's writing style. I was really curious as to what was going to happen once the pace kicked in and the mystery kept me hanging on. The beginning was a little slow for me and certain parts throughout (e.g the middle) but I really enjoyed the ending. The writing was definitely a bit up and down for me. It was beautiful, I most certainly can't deny that, but the descriptive text was very hard to get into for half of the book. I think it was more so a dense and heavy read, which caused the story to drag through a couple of chapters, but once you push through that, it begins to lighting up. Either that or you get used to it. I really enjoyed Charlena's ability to allow us readers to feel as if we were in Scotland alongside the characters. From her experience being in the country and her descriptions, you were truly able to see how wonderful the culture is, and how friendly and hardworking the natives seem to be. With the story dragging in some places, but with the writing being so vivid and engrossing, I'd have to say the writing/plot was more so a hit, than a miss. I thought the characters were really well written. I loved seeing how the characters unfolded and how their true personalities started showing as the novel progressed. I think my favourite character was Ben, he was so charming and romantic and really lovely. He never gave up trying to prove things to Ellie, despite their quarrel early in the beginning. I liked how the characters weren't always what I expected and they were all rather unpredictable. I think because Ellie was one of those characters who didn't really let people in, and had a hard time trusting others, it really made you think all of the characters were shady lol. I spent half of the book side-eyeing everyone, because I couldn't tell right away who was being honest & loyal. I did however, have a hunch that Ben MacIver, (the son of the John is who trying to steal the estate from Ellie) was being truthful throughout the entire story. He just had such a genuine air to him, that I would have been blindsided if he turned out to be any different. As weird things started happening to Ellie, such as her being ran off the road by a mysterious driver, I started looking at everyone with close eyes. Sadly not too many of the characters are rememberable, but I will say my favorite was Ben. I loved how he didn't stop proving to Ellie that he didn't have a hand in any of the dirt surrounding the estate, (not literally dirt guys lol) and their romance ended up being one of my favorite aspects of this story. I also enjoyed the friendships Ellie formed with Ben's mother Anna, she was such a sweet woman, and no-nonsense Maggie, who made the perfect friend. I really, really enjoyed the ending! It was so unexpected and I was not ready for what unraveled. The story line was also really intriguing and there were many twists that kept me hooked. The mystery was also created really well because even at the end when the truth was discovered, I still hadn't predicted what was going to happen! The only thing I didn't like was the structure. The novel took a while to get into the basic plot and there was a section in the middle where I wasn't as intrigued. But then there was a very good twist and things picked up again so it has it's goods and bads! As I mentioned before, I truly loved how Charlena was able to give us a taste of Scotland in just a few pages. I loved the descriptions of the foothills, even the grass was vividly described. I loved the language, which I attempted to pronounce and failed horribly, and I loved the talk of food! A Scotland holiday causes for a ton of food, whiskey ( a never put a little water in my whiskey, might have to try it) and wonderful people. It's definitely a country I would love to visit. My only dislike to this story would be how it dragged in multiple places. It wasn't anything serious that would cause you to put the book down and DNF it, but you will have to be in the mood for a more heavier storyline if you want to truly enjoy this book. I would recommend What Lies Between to any reader that enjoys a great Adult Contemporary. It consisted of all the elements I enjoy in Adult, rich culture in an amazing setting, a good mystery, and a slow-burn romance, so it's definitely worthy of what I call a pass-along. Now for my dilemma. This story definitely ended up being a bit difficult to rate. My thoughts are very much still conflicted, mainly because of the dragging -- it took me a week in a half to finish, but I'm leaning towards 4 STARS since it still managed to be such a pleasurable read.